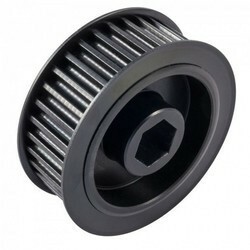 We are offering Timing Belt Pulleys to our clients. 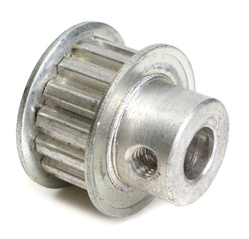 We have marked a reputed position in the market by providing a high quality range of Timing Pulley. Our proficiency lies in providing our customers’ quality approved Timing Pulley. These are designed using top quality material and modern techniques keeping in consideration the laid standards of industry. Fenner Synchronous Timing Pulleys offer a comprehensive and integrated package of belts of the highest quality and power capacity along with a versatile selection of standard Taper Lock Pulleys covering a variety of application in the area of power transmission. With the help of our skillful experts, we are competent to offer a superior series of Chevrolet Beat Petrol Tensioner Pulley with Star Gear, which is known for their reliable features. These products are utilized in the market for various purposes. Our products are made using the top quality material and advanced technology. Timing Belts constructed with gear like teeth engages with mating grooves in the pulleys, giving positive or perfectly synchronous speed drive. It gives the flexibility of belt drive with the advantages of chain and gear drives. Available in XL, L, H, XH, and XXH Section and 5M, 8M, 14M, 20M HTD, belt and its pulleys. Specification MXL, XL, L, H, 3 M, 5 M, 8 M, 14 M, T5, T10. T20, AT5, AT10, AT20 in M.S./Aluminum/EN8/EN9/EN19/EN24 material as per drawing as per requirement. We have carved a niche amongst the most dominant names in this domain, indulged in providing superior quality range of Fenner Timing Pulley.